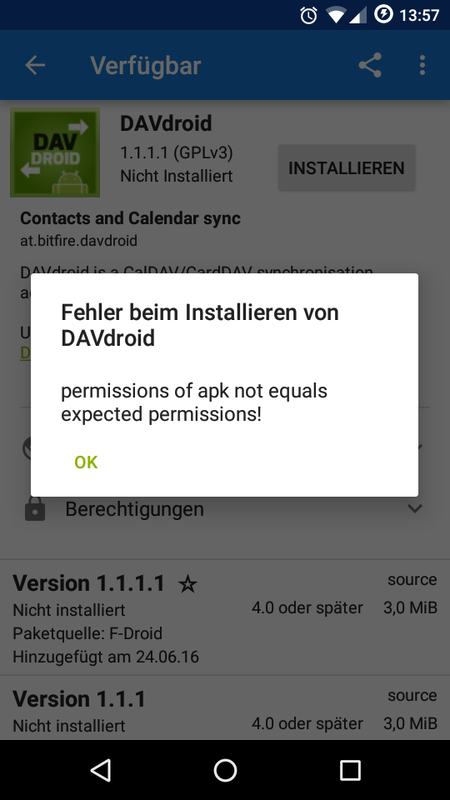 F-Droid Version Update - "permissions of apk not equals expected permissions"
Uninstalling the app and trying to install it again doesn’t help: same error. I think, it’s something related to DAVDroid because I can install and update without problems other apps. My last installed version was the 0.9.2 (not 100% sure, I’ve uninstalled it). If it can help, I’ve a Cyanogenmod 13 running on a Motorola Moto E 2015 (also updating the SO doesn’t help). My F-Droid version is the 0.101-alpha1. We don’t have any influence on F-Droid. They compile our source code and provide their apk (signed by their key). Also, DAVdroid permissions didn’t change in the latest versions. We didn’t see any problems with our own binaries. Taking all this into account, I don’t think this is a DAVdroid problem. Does the error message come from F-Droid or Android? How does it look like? Is it only when updating the app or also when installing it? Did you ask in the F-Droid forums? Also, please provide steps to reproduce. UPDATE: yesterday someone opened an issue about it on F-Droid issuetracker, here is the link: link. F-Droid (see the image below), Both: updating and installing. I’ve not asked yet, but I’m gonna do it. then come the error message. @orco Seems like F-Droid doesn’t interpret the API-level permissions correctly (yet). I’ll tag this as 3rd-party problem. There is a problem in F-Droid 0.101-alpha1 with permission for SDK > 23. It even prevented updating F-Droid itself to a version that has the fix. So the fix here is to uninstall F-Droid and reinstall it again from website apk download. Then you can install/update DAVDroid to the newest version.